In a faraway land, the elves, Dwarves, Orcs, and Hobgoblins stand at the Brink of war. This is great news for you. As a Battle Merchant, you will be selling these races their weapons. And business is about to boom. 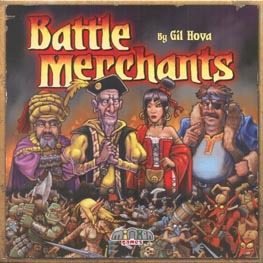 Battle Merchants is an economic strategy game where players ply their weapon wares to all sides of a year-long battle. You might strive to offer the finest, longest-lasting weapons in the land. Or quantity over quality may be your style as you curry favour with as many races as possible. Either way, once the year is over the war will end. Only the wealthiest player will win and become the ultimate Battle Merchants. At least, until the next war!